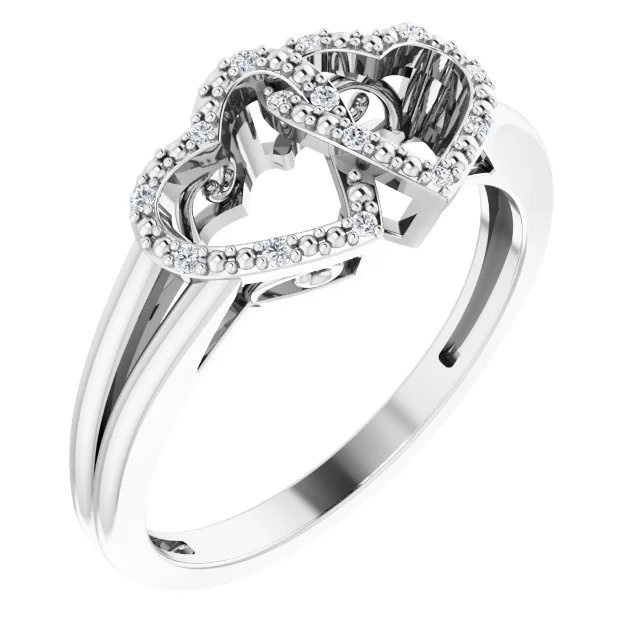 This darling ring features two hearts decorated with 14 diamond accents. Polished sterling silver. Diamond details: .05 ct tw, I2 clarity, G-H color. Top width: 8.5mm. Approximate item weight: 2.85 grams. Available in whole finger sizes 5-8. I would definitely recommend this product to anyone!!! I would definitely recommend this product to anyone. My girlfriend, now fianc̩ really enjoyed it!!! Come to find out afterwards, the ring is exactly like the ring that her grandmother received when she was asked to be married 40 years ago. Absolutely wonderful craftsmanship!!! Beautiful ring!! !